Gould Park, a public park 7 miles north of Santa Barbara, was purchased by the town in 1926 and is relatively undeveloped. It is the gateway to the larger Los Padres National Forest. We’ve mapped out two good runs in Gould Park: A run along a paved road to the Hot Springs, and the more technically challenging Cold Spring Trail. Hot Springs Trail: There is no better treatment for tired legs than a soak in a hot spring — which is why we love this challenging two mile run through the front country of Montecito., with good ocean views. Starting the loop to the right makes for a moderate run, while going left is easier. The entire path is wide and nicely graded, although there is a steady increase in elevation which will keep your legs working. Don’t worry — the Gaviota hot springs and the ocean views towards the top of the loop make it all worthwhile. The route offers shade and mountain breezes for a hot day, but do bring plenty of water and beware of poison oak on the trail. Note this route has an elevation gain of 1300 feet, with grades up to 10%. 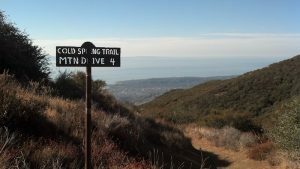 Cold Spring Trail Loop: This one is short and sweet with dusty red track, elevation gain, and ocean views — all for under 2 miles. The trail is wide and well maintained for the most part, but there are some bouldery sections and easy creek crossings, so watch your feet. The climb is a hefty one, but once you get up to the views of the valley, the city, and the ocean beyond, you won’t regret a thing. Plus the quick drop down is a fun exercise in fast feet.